For some five years now, whilst the major US retailers have continued to develop and optimize their e-Commerce sites and logistical capabilities, they have also been turning towards the marketplace model. By becoming the operator of their own marketplaces, the major retailers – Walmart, Best Buy, Urban Outfitters, Jet. com… – are adopting the strategy of openness towards third-party merchants that enabled Amazon to become the "one-stop-shopping" destination par excellence – the one the consumer chooses because they are sure to find on it everything they are looking for. In 2015, the American champion's marketplace accounted for 45% of its worldwide sales. By playing the role of a trusted third party between consumers and the brands present on their marketplace, retailers monetize their notoriety and audience. In this way, they are able to expand their supply capabilities at lower cost and without having to pad out their catalog or swell their stocks. As well as being paid through subscriptions from the third-party merchants and commissions on the sales made via their platform, the retailers can also capture customer insight at source. Thanks to the data collected, they valorize their own catalog by enhancing the relevance of recommendations made to consumers. Although innovative technical platforms like Mirakl make implementing a marketplace easier, it is still very much a business and cultural change for most retailers. The many advantages offered by the marketplace model go to explain the fact that their share of B2C e-Commerce increased by 43% between 2015 and 2016, and accounts for 15% of the total revenues of the sites hosting them3. After the retailers, it is the turn of the B2B players to take an interest and invest in marketplaces – whether it be to pursue a "one-stop-shopping" – type defensive strategy of expanding their offering to cover lots of complementary areas, or, instead, to aim to specialize by grouping together the maximum number of proposed products in a given sphere. Marketplaces also give industrial and service players, who until now operated B2B2C, the chance to address the end customer directly and/or offer their existing distributors an alternative to creating and maintaining their own e-Commerce site. 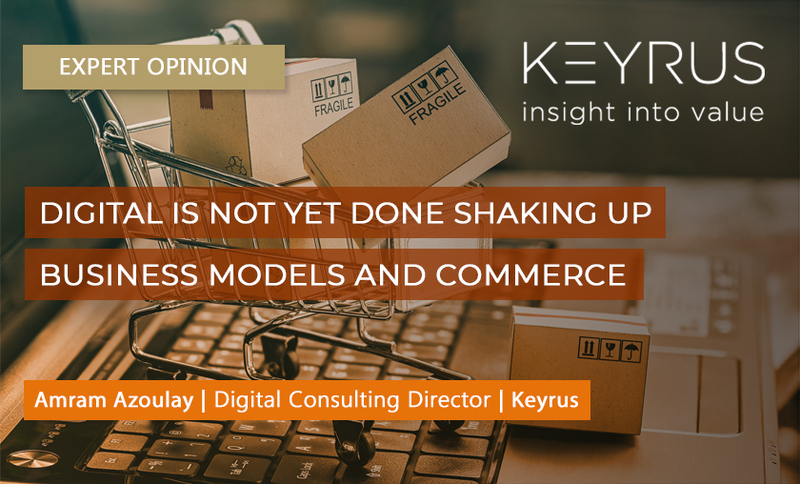 Just as these models are establishing and perfecting themselves, the commerce landscape, in the broader sense, is once again set to be shaken up by new approaches to bricks-and-mortar being adopted by the pure players. Whilst there may have been much talk in the West about Amazon's acquisition of the Whole Foods organic food store chain (June 2017) and the success encountered by its physical bookstores in the United States (13 of them to date), it is in China that the most spectacular advances are currently underway. The e-Commerce giant Alibaba is in the process of asserting its "New Retail" concept, which sweeps away the omnichannel commerce problems that remain central to the concerns of European retailers. New Retail represents a fusion of the online and in-store experiences, and the full integration of digital into classic retail commerce, with, notably: personalized merchandising on mobile; virtual changing rooms; access to customer reviews, information on product characteristics, and explanatory videos simply by scanning a product; ultra-simplified purchasing and payment on mobile (via Alipay), and, of course, home delivery. Alibaba demonstrated its concept on an unprecedented scale during the 2017 Singles Day: 140,000 merchants joined in the event, which took place both online and in the partner stores fitted with the cutting edge "in-store" technology developed by Alibaba. The result: 25.3 billion dollars of sales in 24 hours, 40% more than on the 2016 Singles Day, and a phenomenal amount of customer data collected. Whilst Alibaba may be at the cutting edge of these developments, WeChat (Tencent) is not far behind: much more than just an instant messaging service, WeChat is the near-universal application used daily by more than 700 million Chinese to communicate, deal with administrative tasks, buy products and services, pay… For any brand wanting to count for something on the Chinese market, having an official WeChat account is as crucial as being on Tmall, Alibaba's marketplace. Seen from Europe, the accelerated digitalization of Chinese commerce is a real tsunami, and a foretaste of what is to come for European players, because, with their formidable financial muscle, the major Chinese players are taking their offensive well beyond the borders of the Middle Kingdom, and will continue to do so. Alliance strategies are currently on the agenda – Alibaba is believed to be in the process of acquiring the US retailer Kroger – , but what we should really be banking on is the Chinese model itself making inroads: a model that makes heavy use of digital and mobile to permanently erase what is left of the barriers between e-Commerce and bricks-and-mortar, between B2B and B2C, and between products and services… This is one revolution that we need to prepare for by looking a little less to the West, as we have grown accustomed to doing, and much more towards the East, because it is certainly from that direction that the winds of "total commerce" are blowing. Amram Azoulay has over 15 years' experience in the field of telecommunications, customer relationship management, and digital (e-Commerce, marketplace, etc.). He is mainly involved in major digital transformation projects: scoping assignments centred around the definition of new business models, innovation support within organizations… Within Keyrus, Amram steers the activities of the Digital Hub (ensuring the transversal coordination of the Group's digital offerings) and heads up the digital consulting practice. Le commerce en 2016, INSEE, juin 2017.